Is Your Art Blog on its Last Leg? Get Help! FUN FACT: Studies show that 75% of art blogs are incredibly boring. – Who are you talking to on your blog? Who’s reading it? – What’s your blog really doing for you? Are your blog posts leading to sales? – Are you spending a bunch of time writing blog posts that nobody reads? – Do you agonize over coming up with interesting ideas for what to write about? 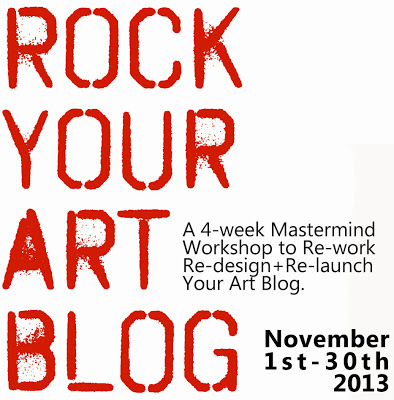 The Rock Your Art Blog Mastermind will be a hands-on, intensive workshop space created to help you rework, redesign, and re-launch your art blog. Your investment in this 4-week mastermind is just $125. Class Taught By: Kesha Bruce | An American artist living and working in the US and France. Get a FREE chapter and Short-Term Goal Planning worksheet from “The 5 Step Art Career Make-Over”.